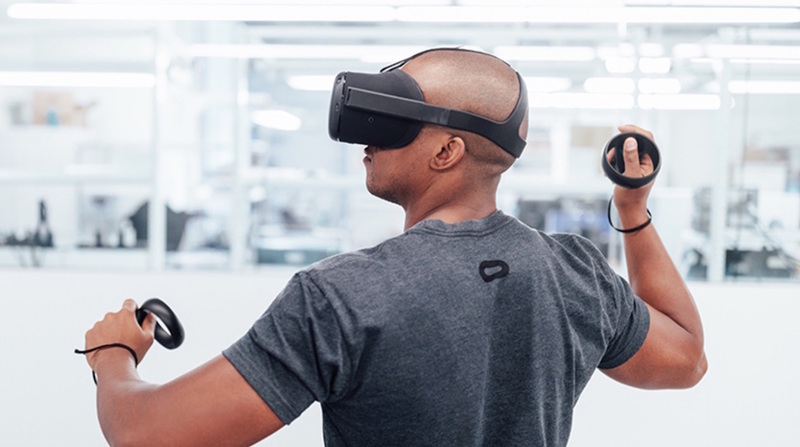 Today at its Connect keynote address, Oculus gave an update on its high-end standalone headset, Santa Cruz. This headset is not the same thing as the newly announced Oculus Go, a more mid-level standalone experience. Santa Cruz is a step above Oculus Go, featuring six degrees of freedom rather than the four degrees of freedom that Go features. Oculus also says the headset is pretty much like having a "full-blown mobile computer strapped to the back of your head." The high-end standalone headset will make its way into developers hands next year, and they'll also get to play with the new Touch controllers for the headset. Looks-wise, these new controllers swing the rounded ring upward, over your thumb rather than below the controllers' triggers. These controllers are also positionally tracked, and have infrared LEDs that can be tracked by sensors in the headset itself. They have a high degree of range and you can even lift your arms above the headset and see them being tracked by the headset. That tracking is possible because the Santa Cruz headset uses four ultra-wide sensors, which you can kind of see on the four corners of the headset. If it works as it's all intended to work, and from the video it's certainly impressive, Santa Cruz may usher in the untethered virtual reality experience we've dreamed of.